Today's post will look at the cancellations associated with these issues. Next week, I will look at postal history and the following week, I will look at the provisional surcharges, which include some of the rarest items in all of British Commonwealth philately. Bakana - opening date unknown, earliest recorded date May 1, 1892. Benin River - opened November 1891, and earliest recorded date is January 25, 1893. Benin - opening date unknown, earliest recorded date March 29, 1893. Bonny River - opened November 1891 and earliest recorded date is February 6, 1892. Bonny - opening date unknown, earliest recorded date is April 19, 1894. Brass River - opened November 1891, earliest recorded date is August 30, 1892. Brass - opening date unknown, earliest recorded date is March 22, 1894. Buguma - opened January 28, 1893, earliest recorded date is April 4, 1893. Forcados River - opened August 28, 1892, earliest recorded date is September 26, 1892. 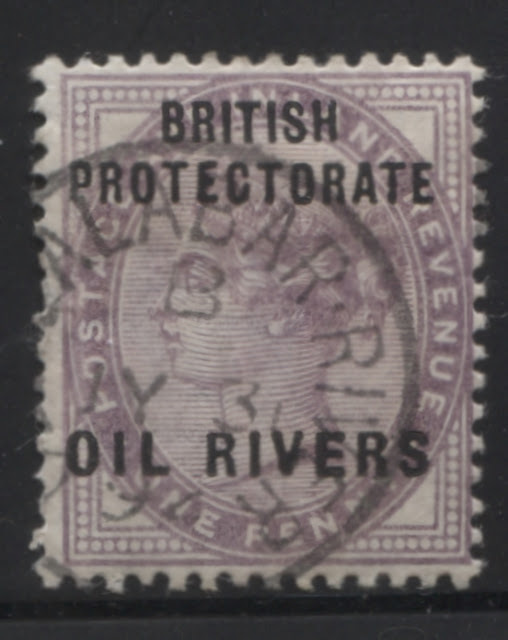 Old Calabar River - opened November 1891, earliest known date is February 7, 1892. Old Calabar - opening date unknown, earliest known date is September 28, 1892. 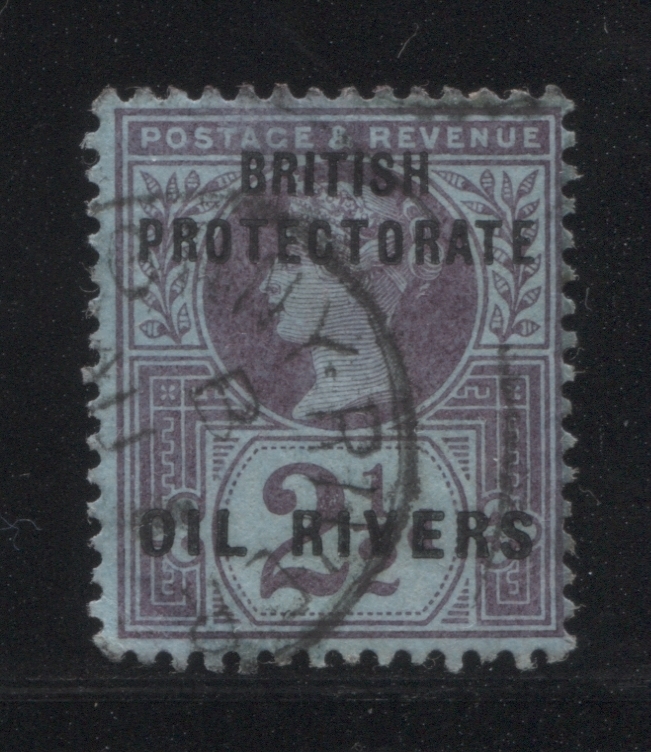 Opobo River - opened in November 1891, earliest known date is June 24, 1892. Opobo - opening date unknown, earliest known date is April 16. 1894. Qua Iboe River - opened November 14, 1892, earliest known date is November 21, 1892. Sapele - opened April 4, 1895, earliest known date is June 28, 1895. Sombreiro River - opened December 23, 1892, earliest known date is April 1, 1893. Warri - opened November 1891, earliest known date is December 26, 1893. All of these post offices except for Sapele were open during the period covered by this issue. 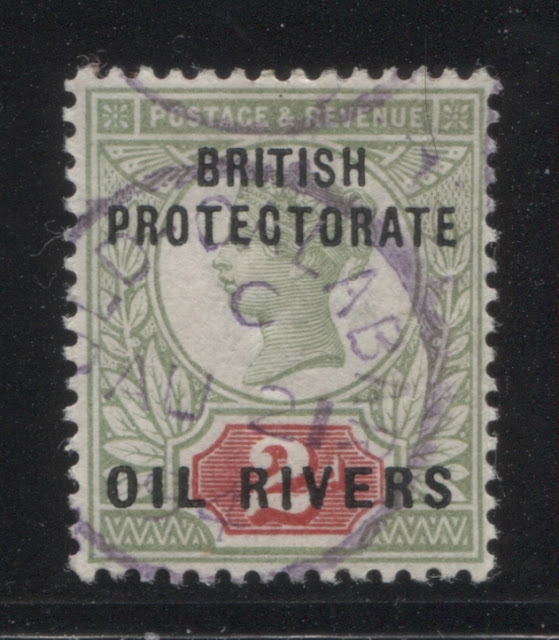 Circular date stamps: These come in two major types, which differ according to the size of the letters and the width of the circle enclosing the cancellation. The first type is a circle that varies from 20-22 mm in diameter. The town name appears at the top, and a two line date appears in the centre. The second type is 22 mm wide, with smaller, narrower letters (2.5 mm versus 3 mm). 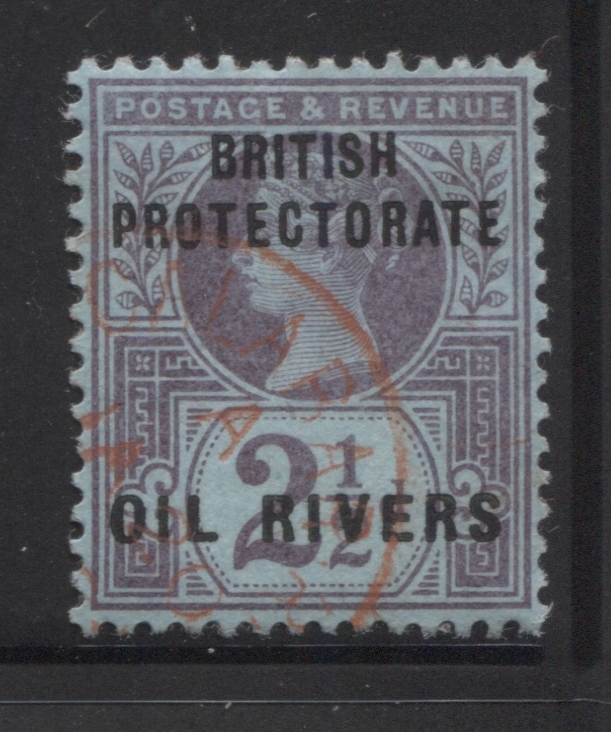 This second type did not come into use until 1898-1901, so should not be found on this issue. Many of these will exist as CTO's the easiest way to identify these being the presence of gum on the cancelled stamps. 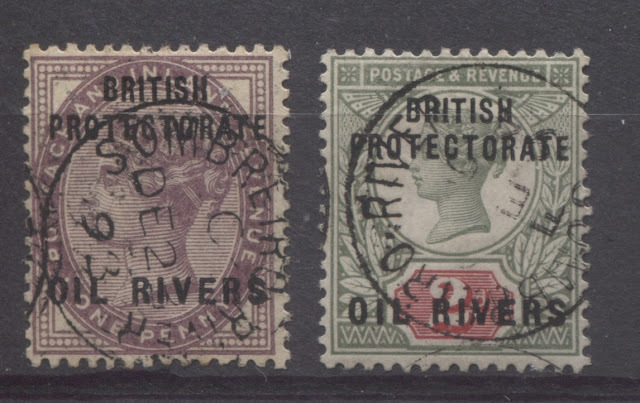 These cancellations can be found struck in black, violet and red. Squared circle date stamps. These were generally used for registered mail only, but Warri used them in place of regular date stamps, as the regular CDS hammer was lost in transit and never arrived in Warri. No examples are recorded for Bakana, Buguma, Forcados, Qua Iboe and Sombriero River. Heavy double circle parcel stamps. These are 27 mm across and the town name appears in the centre of the circle. No example is known as yet for Forcados. Registered handstamps. There are three major types. The first is like a CDS that is 22 mm wide. According to Ince, it was not introduced until 1896, so it should not occur on this issue. The second type is a small oval measuring 28 x 22 mm. It is only recorded as having been used at Old Calabar, with the earliest date being June 11, 1894. The third type is a larger oval measuring 30 m x 22 mm, According to Ince, it was not introduced until after December 1899. So it is unlikely that this cancellation would be found on these issues. A dumb cancellation for Bonny which consists of five parallelograms in solid black, separated by narrow white spaces. According to Proud and Bailey, Bakana, Buguma, Qua Iboe and Sombriero River are by far the scarcest of these cancellations, being very highly prized in cover. Most are valued at 10 pounds on single stamps and 100 pounds on cover. Sombriero River is valued at 25 times these amounts for non-cto examples. This lovely strike of a Bakana CDS is the only one that I have of the set, due to its scarcity. It shows date code C and is dated August 8, 1894. 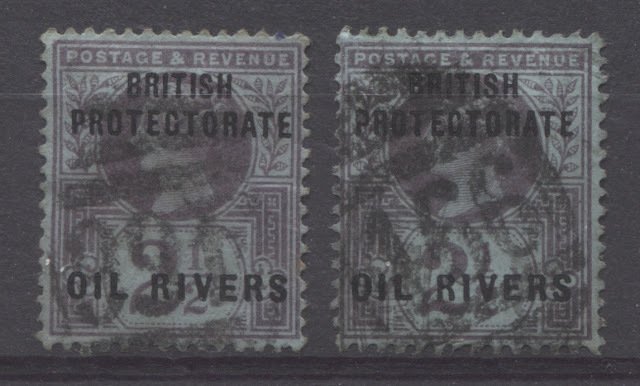 For Benin River, I have the first three values of the set. Three of the cancellations are in red, dated January 8, 1894 and May 30, 1894. The 1d is dated April 1, 1893. 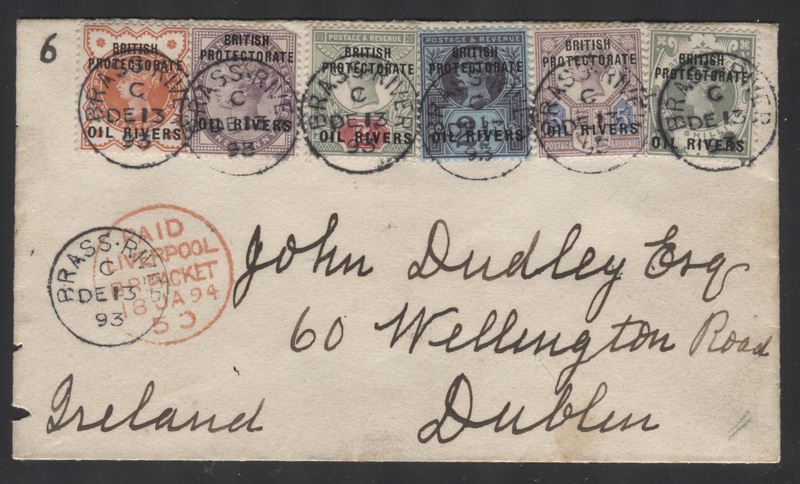 All of the postmarks shown here have date code C.
This is the only example of time code B that I have for the entire issue. Most cancellations are code C, followed by A. This is a more than 50% complete strike of the dumb parallelograms cancellation that was used at Bonny in 1892. For Brass River, I have two loose singles and one cover that bears a complete set. 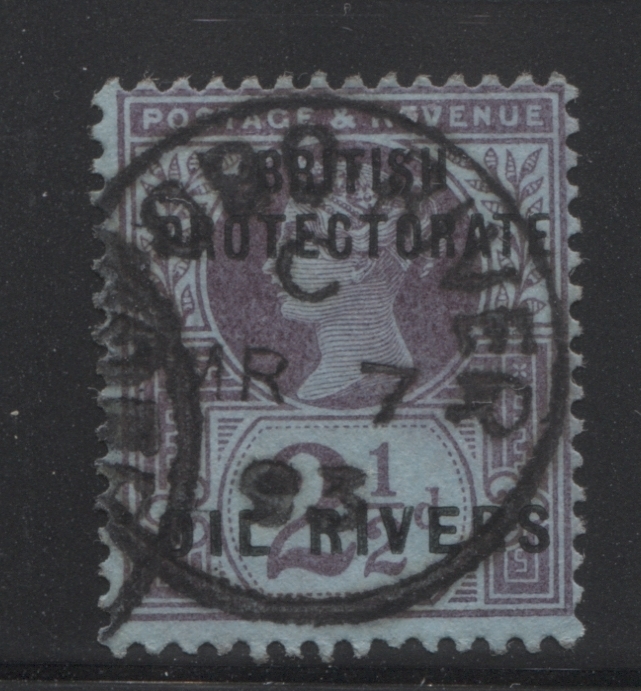 Both postmarks are time code C and are black. The 2.5d stamp on the right is dated October 10, 1892, which is a reasonably early date, given that the earliest known date is August 30, 1892. 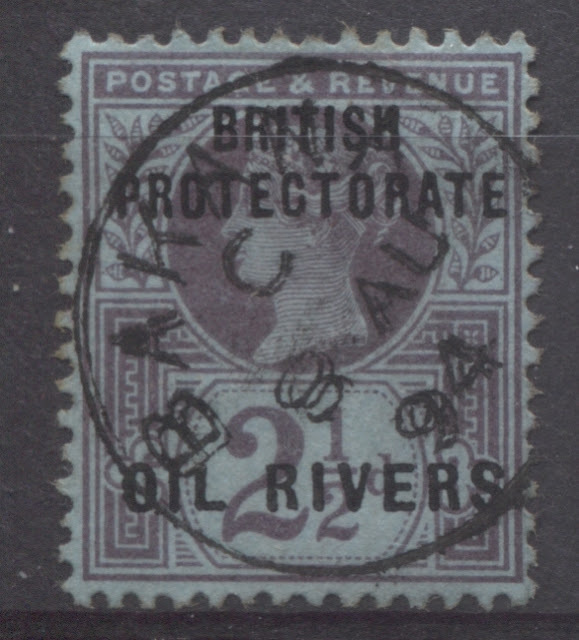 This cover, addressed to Ireland and sent on December 13, 1893 from the Vice Consulate in Brass, bears a complete set, each stamp of which is tied by a nice clear postmark with date code C.
Out of a few hundred used singles of this issue, I have only a few stamps that were cancelled outside the protectorate. The stamp above was cancelled in London on February 6, 1893. These stamps bear the "Paid Liverpool Packet" handstamp that us usually struck on the envelope and usually in red, but also in black. 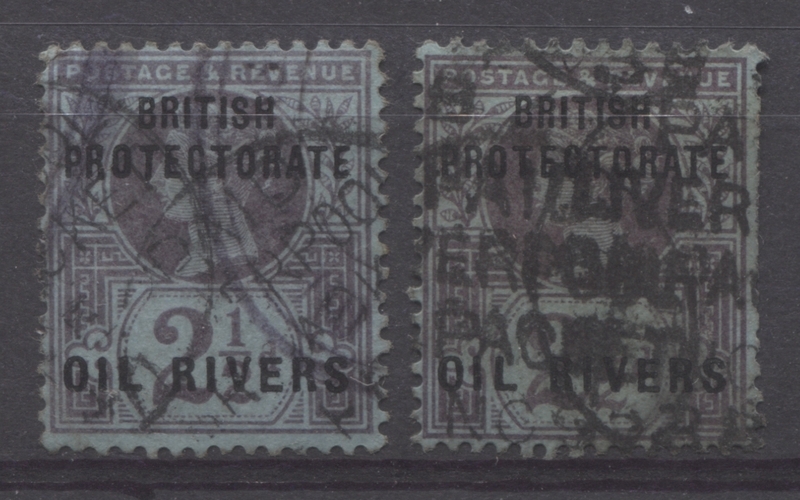 These two stamps are struck with barred numeral cancellations from Easingwold (931) and Liverpool (466). Many of the CTO's found on this set are cancelled at Old Calabar. However many in-period cancellations exist also. I have all values of the set except for the 1/- with this cancellation. All are struck in black, and all are time code C. All of the examples shown above are dated between March 1894 and June 1895. This is one of the more common cancellations from this issue. This 1894 registered cover sent to London shows a nice example of the Old Calabar registered handstamp. For Old Calabar River I have the entire set cancelled with this CDS. Dates are mostly in 1893 and 1894. 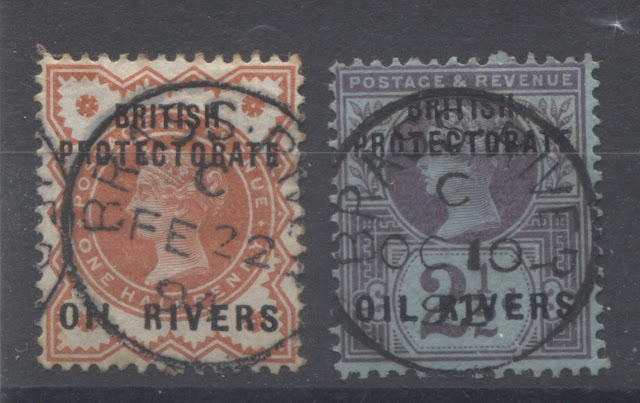 All of the cancellations above are struck in black, with all values except the 1d being time code A, and the 1d being time code C.
The above 2d stamp is the only loose single stamp that I have which is cancelled with a strike of the Old Calabar River registered oval handstamp. I have three examples of these scarce and seldom seen cancellations. The 1d on the left is an example of the "New Calabar" (Degema) cancellation. The 2.5d in the middle bears a red cancel for Benin. 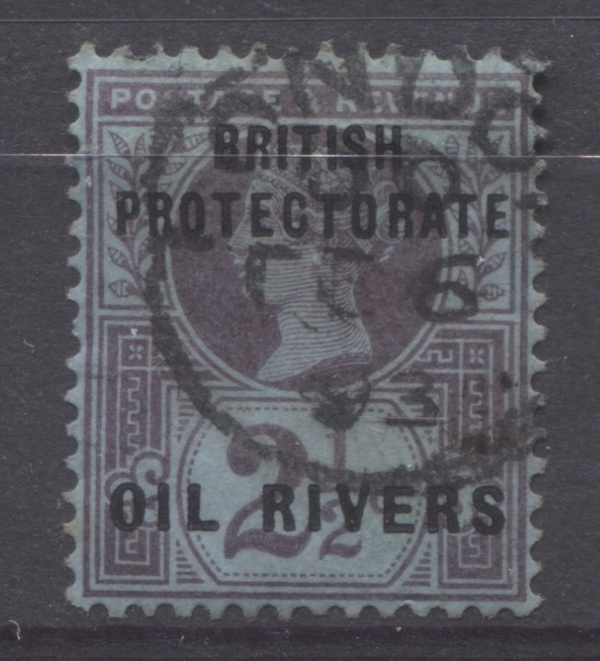 Finally the stamp at right shows a black strike of an Opobo parcel post cancel. 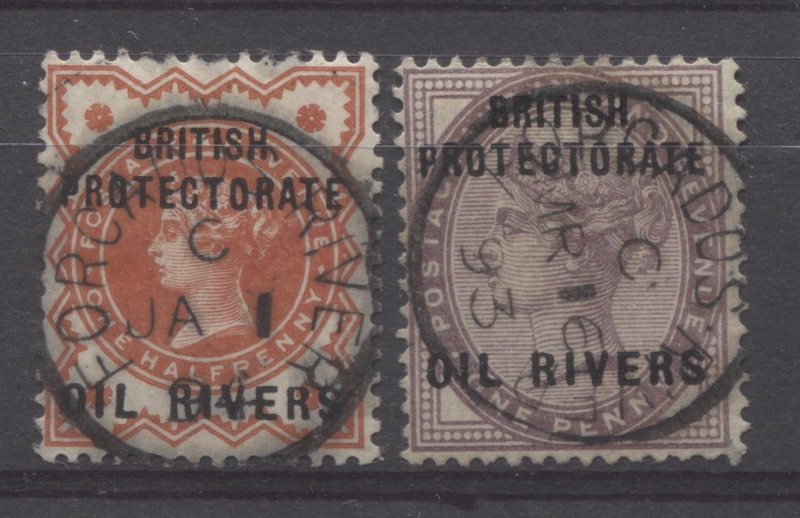 According to Proud and Bailey, this is one of the scarcest cancellations on this issue, with clear examples being valued at 250 pounds each. Both cancellations show time code C, and are dated late 1893/early 1894. I have three of the five values of this set cancelled with squared circle cancellations. The town name on the 1/2 is not clear, but it is of interested because it is the only squared circle that I have seen that is not struck in black, but in red. 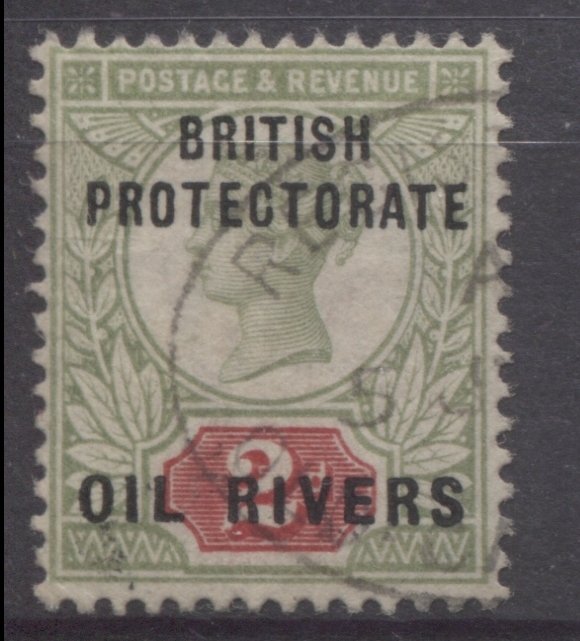 The second stamp from the left is "Brass". Then we have two Warri squared circles and finally one for Benin. This is another one of the very scarce cancellations from this period. 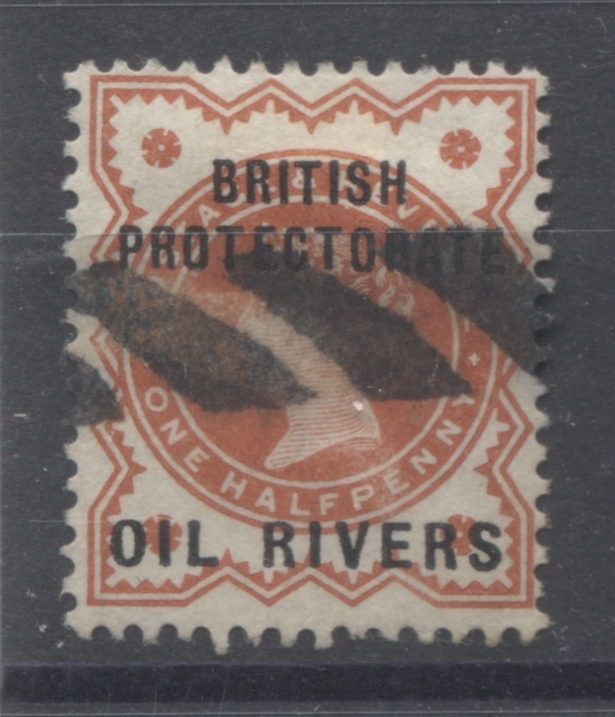 Proud and Bailey value a clear cancellation off cover at 10 pounds. I have all values of the set cancelled with this CDS except for the 1/-. All of the strikes shown here are time code A, and all are dated in 1894. March 16, 1893 to January 1, 1894. I have the entire set used at Opobo River, as shown by the examples above. All of these are struck in black, and all are time code A, being dated between June 1892 and September 1894. This concludes my exhibit of the cancellations found on these issues. 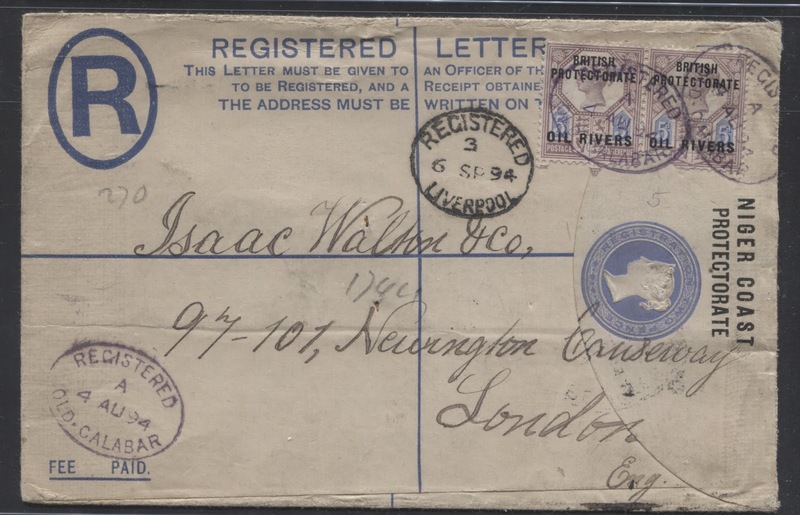 Next week I will look at the postal history, including postal stationery, and then the following week, I will look at the provisional surcharges.